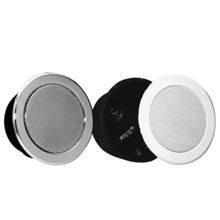 This fire-proof type ceiling loudspeaker is ball-proof according to DIN 18 032 part 3. The extension of delivery includes 2 cable exits with PG16. Ceiling loudspeaker made of powder-coated metal in RAL 9010 with a high efficiency and a high-quality 165 mm full range loudspeaker chassis. Fix the dome with screws or nails before fill up the concrete. The mounting occurs quickly - without any screws - via 2 spring clamps. The easy adaptation with two hands is possible because the loudspeaker has already been fixed before with one of the two spring clamps.